This grandest of all grand Central stations looks out over a thunderously bustling intersection of roads, shops, subways and services. You emerge from its elegant collonade and delicate motifs into an environment that is anything but. It’s just about possible to appreciate the idea behind the birthplace of modern Hendon, but the reality has been long since battered into submission. Best to linger a little longer among the pillars, especially if the weather’s on the turn. I lived round here for two years and trained myself to co-exist with the noise. For the traffic never stops. One night there was a power cut and I went on to the roof of my building to see how much of the area was affected. Even though it was 3am the roads were still busy. Three lanes of vehicles sweep down from one direction en route to Brent Cross and the North Circular Road. They charge past the other way heading out towards the M1. Bisecting them comes traffic to and from Golders Green and Kingsbury. A greater contrast with the surroundings of Hendon Central’s neighbouring station, Brent Cross, it is difficult to imagine. Yet both were designed by the same person, Stanley Heaps, and share if not a sympathetic location then a stubborn beauty. I can vouch personally for how welcoming that entrance could be during winter. It’s not a building that dominates or defines its surroundings in the same manner as its nearby sister. It cannot compete for attention with what has become an enormously intimidating adjacent road junction. But this lends the station a rather attractive melancholy feel. Its greatness is now tinged with sadness. Hendon Central is becoming evermore a sentinel, isolated from everything around it by nature of its style and purpose, yet guarding a gateway to a more decorous way to travel. It hasn’t always been like this. There are probably people still alive who’d say they can remember when Hendon Central was all fields. And they wouldn’t be lying. I don’t remember fields, but can remember when the space now occupied by the ramp and steps to the underpass was a bus lay by for the 143 that terminated there (133 to South Croydon on Sundays, a mere 23 miles away). Pedestrians could cross the road safely at street level. 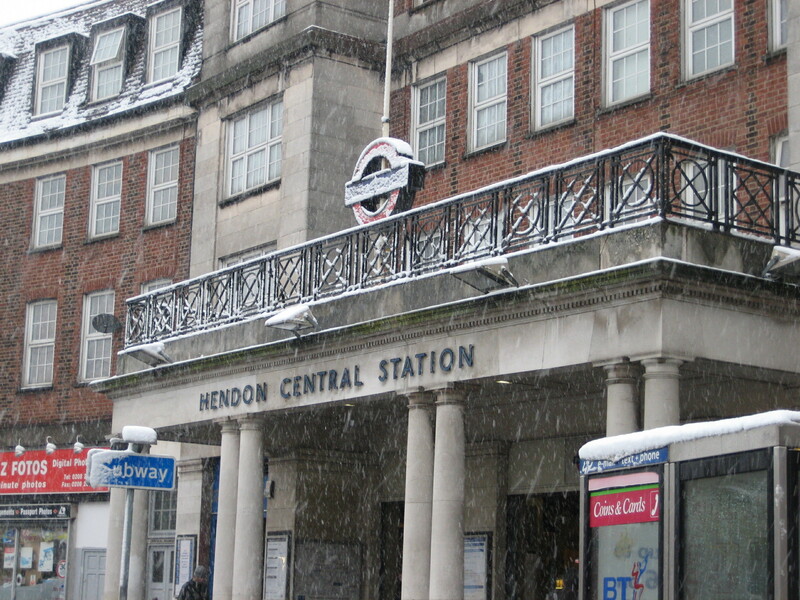 I had a friend who lived in Hendon in the mid-90s. I would visit her via the grim 80s Thameslink station, squished next to the M1 and accessible via hellish bridges. Until, on one visit, we decided to go into the city via the Underground instead. 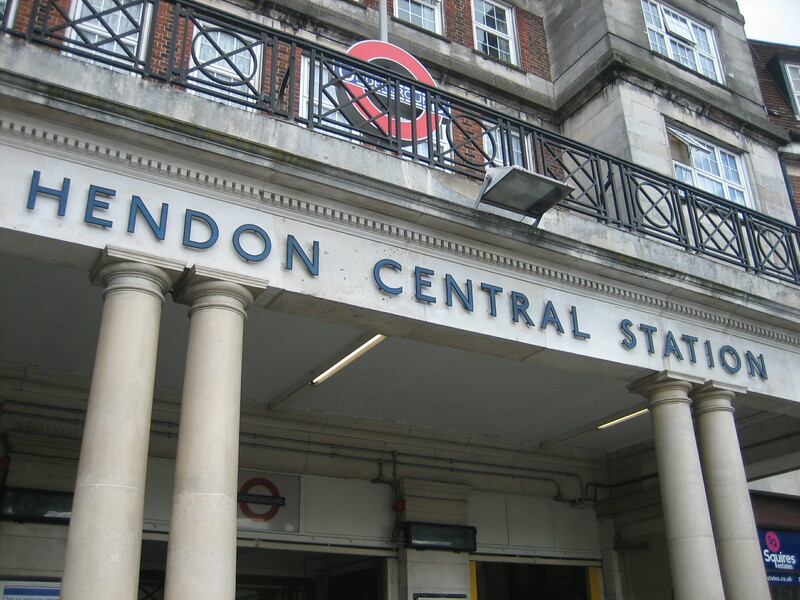 Hendon Central was an absolute revelation for me – I fell for it heavily. I haven’t been back but in my head it’s still this incredible beauty of a station. I do love the difference between stations. Let me know if you run into any of the abandoned stops above ground! Not the original facade though, a lorry crashed into that in the 90’s and it had to be repaired and partially replaced. 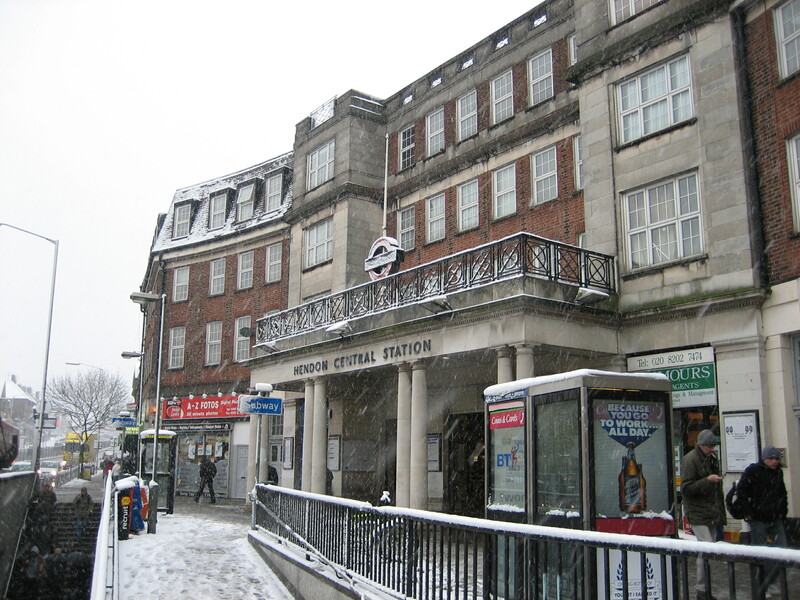 was the building not build over/above the tube station (which was roughly the same size as brent cross)?